I´ve been teaching esl for a long time, but still appreciate all the help, forums, and worksheets teachers share on this site. A detailed look at the suffix “less”. 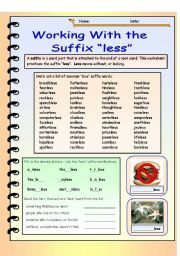 This WS includes a quick explanation and meaning of the suffix “less”, lots of examples and six various exercises ranging from easy to moderate. Template inspired by PhillipR. Negative Prefixes “dis”, “non” and “un”, with Answer Key. Editable. Prefix practice using the negative prefixes of “non”, “dis” and “un”. Included is a simple explanation, examples and six exercises. 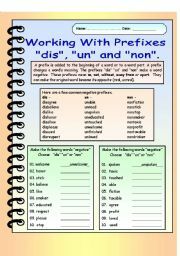 Students need not know about prefixes to be successful and be able to complete the exercises. Template compliments of PhilipR. 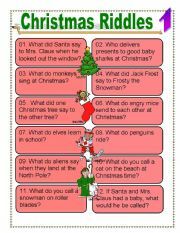 Christmas riddles for intermediate language level and above. Some of the riddles are ´play on words´ so they would be challenging for beginners, but once they are told the answers they get it and everyone laughs. Clip art courtesy of P. Martin. 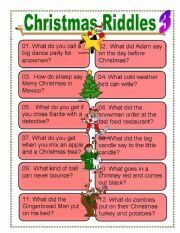 Christmas riddles for intermediates or higher. Lower levels will still laugh when they are told the answer, but higher levels may be able to figure out the answer. Some questions are based on ´plays on words´. My students do love them although they are beginners. Merry Christmas. 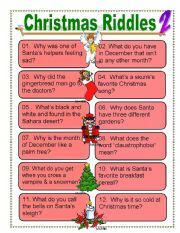 Another Christmas riddle sheet with answers and notes. These are best suited for intermediate learners and higher, but can be used with beginner if the answers are explained. (Some questions are based on "play on words". My beginner classes enjoy them when the ´get´ the joke. 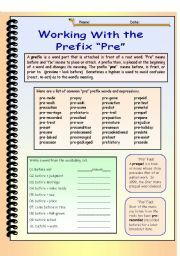 This is a detailed look at the prefix “PRE”. This WS includes explanations, word lists, “Pre Facts”, and 5 different exercises. Template inspired by PhilipR. Editable and Answer key included. Here is the second installment of 12 Halloween riddles for you and your students to enjoy. Answers to riddles are common creatures of Halloween. Some are challenging because they use the English language and play on it. These would be difficult for beginners. 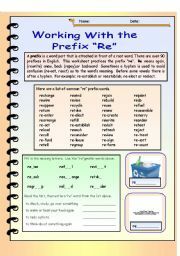 A detailed practice using the prefix “re”. 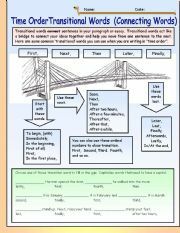 This worksheet includes an explanation, example word list, and six different exercises ranging from easy to challenging. In my attempt to save toner, coil rings have been pared down, and the shading seen in a black and white document is negligible . Worksheet format inspired by PhilipR. 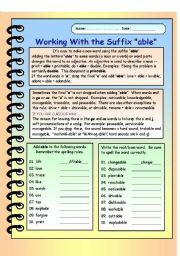 Working with the Suffix “able”. Editable with Answer Key. This presentation shows some of the customs and superstitions associated with Lunar New Year. (aka Chinese New Year). The show ends with 10 questions to check student’s understanding. This Remembrance Day ppt looks at why we wear a poppy. It briefly talks about the major world wars supported by photos. The presentation contains the question, "How will you remember", and ends with some suggestions that students could do to remember. This presentation is the first of two showing the customs of family, foods and home associated with Lunar New Year. (aka Chinese New Year). The show ends with 10 questions to check student’s understanding. The other presentation details customs and superstitions.